Over the decades thanks to Hans Christian Anderson, Walt Disney and others, the mermaid has been softened to make her more family friendly. She’s this sweet girl with a tale who swims, sings and wishes she had legs. Kids look out into the sea hoping to see a mermaid frolicking in the waves. Little girls beg for a pull over mermaid tail so they can splash around in the pool. The mermaid is a happy creature. But originally these half woman and fish creatures were monstrosities that put fear in a sailor’s soul. Mermaid, Lake of the Dead takes us back to those glory days when a mermaid scared us and wasn’t happy to sell us coffee. Roma (Efim Petrunin) seems to have things going well. He’s got a great fiance in Marina (Viktoriya Agalakova) and they live in the city. Before the wedding he inherits a country cottage which sounds great. Except the place is in kinda bad shape. But that’s ok because he’s going to use it for his bachelor party and he’s going to be getting wasted so why not have the place already trashed. While the party starts up Roma discovers that lake might not be great for trout, but has a mermaid (Sofia Shidlovskaya). She has a past with his family. When the mermaid gets out of the water, she sets her sights on Roma. While Roma sees her as this hot seductive young woman, she can quickly transform to her true self with very pointy nasty teeth. She also doesn’t plan on letting Marina marry her new man. It’s a nasty showdown between woman and fish-woman at the cottage. Can Marina put an end to this or will she lose her deposit on the wedding hall? Mermaid, Lake of the Dead is a very effective horror thriller as the mermaid swims around the married couple. While the movie was made in Russia, the special effects are very effective. The mermaid going from cute to fearsome is flawless. It’s smoother than anything seen on the straight to SyFy shark mutant movies. The film goes beyond just the scary effects since there’s the whole what could go wrong so close to a wedding. Who can expect “cursed family mermaid seduces future husband” as an issue? You feel for Marina having to deal with the fact that her boyfriend is getting pulled away from her by this horrifying creature. 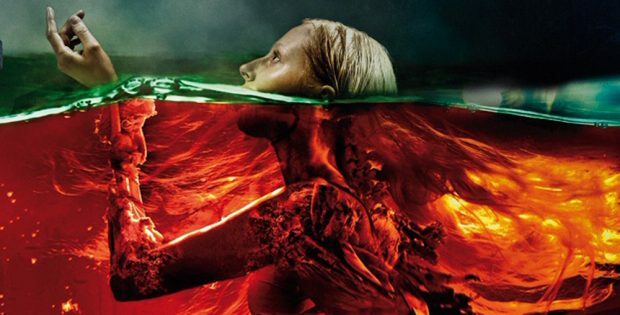 Can she break the connection between the mermaid and Roma? Is this as bad as an ex-girlfriend popping up from the cake at a bachelor party instead of a stripper? The video is 2.35:1 anamorphic. The transfer brings out the murky nature of the mermaids lair and the rundown cottage. The audio is 5.1 and 2.0 DTS-HD MA so you can chose to have the snarls go around you. There’s also 5.1 and 2.0 mixes in the original Russian. The subtitles are in English. Trailer (2:01) sets up the underwater scares. Scream Factory presents Mermaid, Lake of the Dead. Directed by Svyatoslav Podgaevskiy. Screenplay by: Natalya Dubovaya, Ivan Kapitonov & Svyatoslav Podgaevskiy. Starring: Viktoriya Agalakova, Efim Petrunin, Sofia Shidlovskaya, Nikita Elenev & Sesil Plezhe. Rated: Not Rated. Running Time: 87 minutes. Released: February 5, 2019.